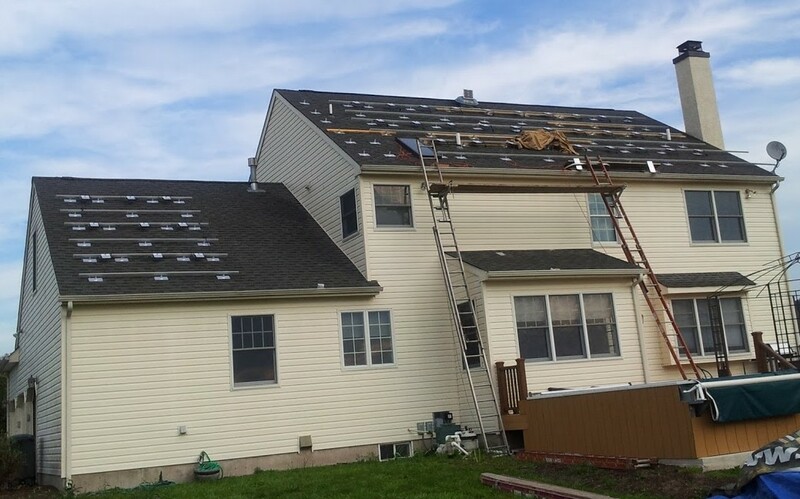 When we discussed our home solar panel project in mid-2011 with friends, one of the first questions everyone asked was, “What’s the payback period before you break-even?” The second question was unsurprisingly, “How much is it costing you?” but the focus always ended up on the payback. After all, if you’re going to invest in green technology, you’re hoping that at some point in the near future, you get ahead of the game. 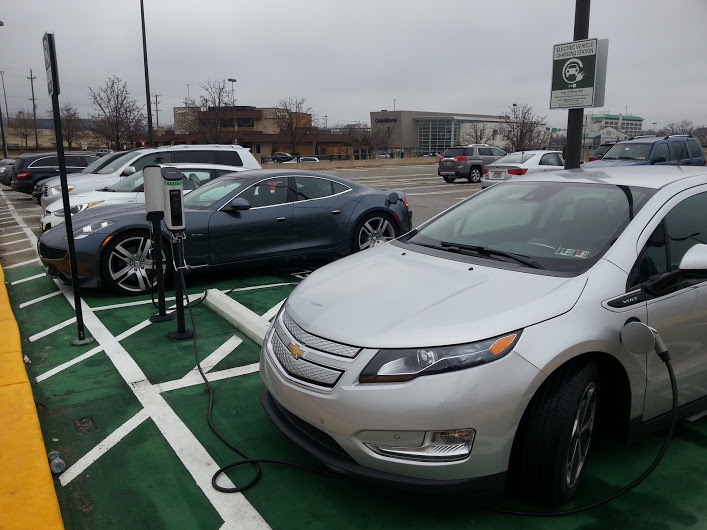 It turns out that something we didn’t plan for — our Chevrolet Volt(s gm) — is actually helping us boost the ROI and cut our payback time in half. I shared details on both the solar panel project and the car before, but let me step back and recap a bit. 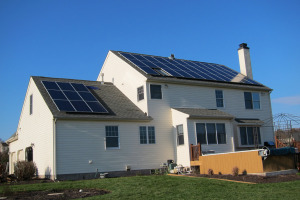 In October 2011, we added 41 solar panels to our southern-facing roof in southeastern Pennsylvania. Each panel is rated for 230W of Direct Current (DC) so that works out to an array of 9.43kW DC. In our family of four, with two work-at-home adults, we average around 7,500 kWh of electricity usage. So the system may be a bit oversized for our needs — about 125 percent — but we planned ahead. It’s a four-bedroom house so we thought that the next occupants could have at least one more family member and therefore use more electricity. At the time, we were quoted a price of $5.50 per watt for the project. When you multiply that price times the 9,430 watts of the system, you get the total cost: $51,865. That’s just the gross cost, however. We received a 30 percent Federal tax credit for $15,560 and a state rebate check of $7,100, bringing the net cost to around $29,205. Our typical electric bill for a year had been roughly $2,500, which makes the break-even point around 11.7 years. A year after the solar panels were installed — they generated 13.8 MWh in the first 12 months and you can see the real-time stats here — we opted to add an electric car to our garage. So we traded in an Acura RDX and, after shopping around, replaced it with a 2013 Volt. This was to be our primary car, just as the Acura was. We have another vehicle in the garage, but it’s a rarely driven sports car: A 2007 model that just passed 18,000 miles on the odometer. Since the Acura was our primary vehicle, we racked up miles quickly. Even though we both work from home, my wife and I are often driving the two kids to activities or head a few miles into town most days for food or other goods. With the Acura we were averaging about $250 per month on gas as a result. Now, with the same general driving habits, we pay a maximum of $50 on gas in a given month. With the Volt — you can see driving stats for that too — we’ve already turned 7,228 miles in the six months of ownership. That’s normal driving behavior for us: We typically drive about 15,000 miles on the main car. Of those miles, 5,255 have been solely on battery power and the car reports our gas mileage at 125.33 MPG so far. Even though we’re averaging 1,250 miles per month, we’re only filling up the gas tank once — or maybe twice — in a given month. The tank is small too: Just over 9 gallons. So what does this do to our solar panel payback? It cuts it nearly in half to around six years. How so? Three-quarters of our driving is powered by electricity. Even with the addition of the Volt, which we charge every night, we still don’t have an electric bill. We’re at the point where we’re much closer to using all of the electricity our panels produce, but we’re not there yet. And we’ve cut down on our gasoline expenditures as a direct result of both the car and the solar panel system, saving around $200 per month that we used to spend. That works out to $2,400 a year in gasoline savings and when added to the $2,500 in electricity bills we’re no longer paying each year, you get $4,900 in net cash flow savings. Divide that figure in to the net cost of the solar panel project and it works out to 5.96 years before break-even. Best of all, the payment for the Volt is slightly less than the Acura payment was, but I don’t consider that as part of the solar panel payback. There was a recent intangible benefit gained by the solar investment, as well. Just before we bought the Volt, we decided to refinance our home. The appraiser added $30,000 in value to the house just for the solar panel array. That gave us the best possible rate because of our LTV, or loan to value, ratio. Without that extra boost in the appraisal, we would have had to pay more in fees to get our low rate or simply have a marginally higher rate. I don’t consider this part of the payback either, but it sure helped! This post was updated at 7:22 am, May 13, to reflect to correct Federal tax credit percentage. The issue here is the continued use of convoluted fuzzy math to justify solar installations. Homeowners who install solar arrays are doing it for the most part out of purely altruistic motivation: better for the environment, get off the grid, that sort of thing. The economic incentives are all very negative. Shareholders in major corporations and Wall Street investment bankers demand huge ROI over very short timeframes to fund projects. Why are individual homeowners required to take 11-20 year ROI? and why are they saying they are happy about it? I submit that the lack of interest in solar power in the average homeowner indicates they are not happy about the situation or everyone would be doing it. The problem is the lack of feed-in-tariffs that require the local utility purchase the solar produced power at the prevailing rate at the time it was produced. Instead the typical homeowner/solar producer simply has their meter spin backward and their bill is zeroed out. That is a rip off of the homeowner/solar producer that really needs to be rectified. Rooftop solar produced electricity into the grid during the day which is the time when electricity is the MOST EXPENSIVE! But homeowner/solar producer typically uses off-peak electricity (evenings and weekends). Granted the author of this article works at home but that is not typical. If power companies were required to purchase all the solar electricity produced at the prevailing rate the authors ROI would drop to probably less than 36 months. The German model should be pursued to encourage build out. The German electric companies are required to purchase all solar/wind generated power at 2.5 times the prevailing rate to encourage installation. That program will sunset in 6 or 7 years but it has served its intended purpose: Germany is the largest producer of solar/wind power in the world. It is true he had to pay for extra panels to support his Volt. But, in a few years that should be cancelled out by what he would have paid for gas, and then the energy for his car will be completely free. Savings of $2,400/year should pay off his panels in perhaps 5 years. ALSO: The extra cost of buying a Volt will be partially recovered were he to sell it. Even without a Volt, our panels will be paid off in about 6-7 years. We added 18 panels, receiived the 30% tax credit PLUS a rebate from Los Angeles Water and Power, so that our final bill was $8.5 K.
Are your rates stable and unchanged over the years? If one also considers a typical electrical rate increase of 6.7% (in our area) that drops the ROI down to about 7 years. Our panels offset about 85% of our usage. And for the next 30 years, too. Also, I think you are seriously underestimating the increase in your property value. A good rule of thumb is multiply your annual saving by 20. In our case that increases our property value by about $17 K, double what we paid for it. And why not; the next owners will save more than that, were we to sell. Thanks for the article. Folks with real vision can gather the accolades of a percentage of people in the present but 100% of people in the future. $52,000,000,000.00 in subsidies to coal and oil out of your tax dollars before you even start to figure in the all the rest of the costs. That is “52 Billion” to deliver your “clean coal”, “cheap gas”, and polititians and legislation bought and paid for. Please don’t talk about the high costs of subsidising renewables without at least putting a smiley face in the comment of course if you can find a smirking face it would be even more appropriate. $52 Billion is just for starters! The Harvard Medical School studied health ill effects of coal. They concluded that coal pollution (particulates, mercury, sulfur and nitrogen oxides, etc) cost the taxpayer $.18/kwh in hidden health costs. (Google search “costs of coal pollution”). We pay, the companies cry all the way to the bank. American Lung Assoc. claims 24,000 premature deaths/year due to coal. So, the renewables are a bargain, avoiding these costs. His “comparable” car is the Acura. It is what he traded in to buy the Volt. Every other car is irrelevant. However long “most” people” keep their cars is also irrelevant. How long he keeps the car is relevant. How anyone thinks this piece is “artificial” when it is based on his actual experience is stunning. What is artificial is analysis based on projections using numbers that are not Kevin’s. To those complaining about energy subsidies, do you limit your complaints to just solar and EV or do you also include coal, natural gas and nuclear? That said, Kevin, can you clarify your numbers? 7500 kWh per month or per year? If it is per month, how do you arrive at the $2,500 annual electric bill? If it is per year, do you really pay $0.33/kWh? And what is your buy-back rate from the utility? always liked your blogs as your interests matches mine. This one however confused me a little bit: what payback period calculation has to do with the excess electricity you don’t’ consume ? Doesn’t your supplier buy the excess energy at the same rate ? In our case, with local energy rate being 11.7 c/kwh, our panels generated 7243 Kwh last year, so yearly saving was $847, meaning we will recoup our cost of $6400 (20 yr lease cost for 5.6kw system) in nearly 8 years, whether or not we use all of our electricity produced. Is that because we don’t price it in the US, or doesn’t it matter? Either the 15% fiqure or the 15000 fiqure is incorrect. 15k of 51k is 30%. Jimr, you’re absolutely correct; for the 2011 tax year, we received a 30% tax credit of the entire project cost. I’ve updated the post to reflect my inadvertent mistake. Thanks! 4.The car financials are unclear. While the monthly payment has been mentioned, the lease term has not. It also seems fair to point out that some 33 – 50% of the fuel savings is from downsizing the SUV, not EV per se. I doubt any of the Hummer buyers who got the $125,000 heavy duty vehicle business write-off ignored that insane “subsidy” when doing the math. That Section 179 depreciation is still around, but it’s been reduced to $25,000. You don’t hear complaining about this, but the $7500 EV credits make some people go bananas, probably the same ones whining about solar energy. Do you know how many TRILLION dollars we’ve spent keeping the shipping lanes patrolled so we can have cheap oil? Solar energy is patriotic! The volt gets appx 30 miles per 13Kwhr charge. The true savings is somwhere closer to $130 a month based on an installed generating cost of roughly $0.13/Kwhr from the investment over the life of the panels. this comes to a savings of appx $1500 per year based on paying cash. The 6 year savings is only apps $9,000 or less than 1/3 the cost so I highly doubt a greater than 50% savings on return on investments from the initial purchase. For what its worth, I’m getting about 44 miles per charge on my 2013 volt in my daily driving. I drive conservatively, but my daily commute includes 2 large hills which cut down on my mileage. The Chevy literature stated I would get 38, so I have been very pleased to be doing so well. Since my numbers are real world and not theoretical, where did you get your number of 30 miles per charge? 2500 per year for leccy? What do you do? Keep the lights on all the time? Our three person family average monthly bill is less than 100 and we r from Illinois. Highest leccy rates in the country! are you joking? Illinios isn’t even in the top 10 of utility rates! you pay less than 10c/kWh! try coming to Mass where the rate easily tops .18c…and my local rates are .21c/kWh and have been going up 10% a year for the past 5yrs. People will always find a way to knock solar. Great job and great article. It is focused on how the ROI effects you. Subtracting the subsidy out of the equation is silly, as you would also have to factor out the economic boost to the economy from your purchase (labor, manufacturing, and sales jobs in the community). but then joebob you have to factor back IN the value of utility power that the family will purchase over 30 years, $2500 and rising 3% per year(conservatively), you’re talking about well over $90k, and that’s money that the family has to earn and pay taxes on, so to pay for $90k worth of utility you’re talking $120k in income.. If the family is smart, after payback(5yrs) they can increase their tax-deferred savings $2000 which over 20 years will easily outperform no solar+29k invested. and that’s without inflation of the utility, because I cannot find a calculator that accomodates it. So it’s not a wash at all, as the value of the utility generated increases with utility inflation which has traditionally been around 6%. So the actual value of the utility savings is much closer to $190k. Now it gets complicated because you have remember the t$95k in utilityax you ALREADY pay on the utility payments means the net earned cash outlay is $120k, so that lowers your yield on the No solar/investment to $80k. deep breath now…because if the solar buyer is REALLY smart they’ll realize that they can tax defer the GROSS amount required to pay the utility bill, which means their $2900 in year six utility is REALLY $4k in tax-deferred income, see? Which means you can INCREASE thier effective yield to well over $200k in 30 years vs the $80k with no solar. Just to be clear I am not against solar power. I favor a good energy mix, and if solar power works for someone I think they should definitely pursue it. Obviously there are intangible benefits in addition to any financial ones, such as feeling self sufficient, and helping the environment. So I get it. While I don’t expect you to have exact calculations in a comment section, your numbers and assumptions are not all correct. I get where you are going with it, and I can appreciate it, but all I am saying is some people should do their homework before making such a big purchase. Perhaps provide the data to an accountant to have them advise you if it makes sense for you or not. It seems it made sense for the writer, and it has worked out for him, so that’s great! But Joebob, there is no denying, no matter WHAT the savings vehicle is that you choose, that (using this customer’s $2500 current bill as our data) this person is obligated to paying over $100k in utility charges over 30 years(using conservative 3% rate increases per year). If his array pays for itself in five years, he saves over $70k in uitility costs and if he similarly invests those savings he comes out VERY far ahead, like it’s not even close. No matter how that $29k grows in a structured plan like a 529….he’s still committed to the $118k in electricity. Once you compare solar/no-solar as an investment…every no-solar yield you have is absolutely ERODED by your growing utility costs! ***I eliminated my rant against 529 plans and prepayment plans for state schools…post-tax=roth IRA. and I’ve never had a planner or accountant tell me that a state pre paid tuition plan is a good idea. I bought my solar array to be green…but once you start actually crunching the numbers there is NO doubt that solar works for EVERYONE who pays over about .14c/kW, who has tax liability and the ability to pay cash or borrow money at close to prime((and a roof that points south, of course). If you live in an SREC state like I do, installing a solar array is like stealing.. If you can eliminate, permanently, one of your fixed necessary expense like shelter, food, water, heat, light etc that is a HUGE saving. Honestly, I hear about larg swaths of the country where power is 7-8-9 cents a kWh and I would guess solar is not profitable there. I’m in the northeast and pay (well, *I* don’t pay anything…but the local rate is) .21c/kWh and is estimated to be .30c/kWh within 5yrs. You really got me thinking about this….$29k invested in the market or in panels….and it’s not a wash at all. In fact, if you were looking to tax defer that $29k, and choose to tax defer the utility savings…you’re looking at over a $200k benefit to installing solar panels. In year six if the homeowners utility rate is $2800…and they invest the tax deferred amount to pay that utiliy, that’s $4k/yr. Assuming that they increase their tax deferred investing to match the inflation rate of 3%…and that their tax-deferred fund yields 7%….the total at the end of year 25(remember they took five years to pay off the panels)….is $337k. I have to go back now and recalculate the original investment, as the $29k spent on the panels would ALSO have been post-tax…so that is $40k pre-tax…at 7% for year for 30 years is $307k. Now again you have to back out the gross cost of the utility, and once again you have to earn $1.50 to pay every$1 in utility costs after taxes. So, over the 30 years that your $40k is growing, you’re paying utility bills starting at $2500/yr and going up 3% per year….that total is $118k, and you have to earn $175k to pay that total(at 30% tax rate). So when you subtract that $175k from your $307k investment…thats $132k. So the “wash” is actually a net difference of $205k. Good article. In addition to the points the other commenters have raised, I would point out that the local utility is also smoothing out the energy imbalance that Kevin’s family is bringing to the local distribution grid. Kevin’s house is likely a net exporter of energy during the daytime, but a big consumer at night when the EV is plugged in. Now that runs opposite of the macro-scale demand curve, so it could ultimately help the utility, but they still need to manage it. If many families in Kevin’s neighborhood all got solar and EVs, that could raise some problems for the utility. But at low penetrations, this is “job well done” overall, kudos! So the bottom line is that the payback does not include the cost to the taxpayers. A cost that our government had to borrow and will pay interest on for the foreseeable future. I’m a huge advocate of renewable energy and have put my dollars where my mouth is in the past having built and lived in a home that was completely off the grid, powered by wind and photovoltaics, but not including the costs of the tax credits and rebates, including the cars is false accounting and economics!!!!! Sorry Ray, cost to the taxpayers is a silly way to refute the installation of renewable energy when you consider how low a percentage of the national and local budgets the 15% tax credit turns out to be. Not to mention the reason why these credits exist is to encourage these installation, you ease stress on the local grid and reduce the pollution generated by coal, oil and natural gas fired plants. Your kind of thinking is really is the true false accounting. Also, the solar panels are for the taxpayers anyway. They are essentially paying for their own solar systems, but it is a single-payer system. At least that money isn’t going to oil companies that probably just keep the money to themselves. I have to agree with PC (because he/she is correct) – this is an artificial calculation. A) If your grid provider pays you for excess (not mentioned that I saw), then you must subtract that from the ‘savings’. If not, the over-sizing is hurting your payback. B) It’s still artificial because you over-sized your panels. The EV then becomes ‘justification’ for this over-size. The correct method would be to compare a properly sized installation for no EV to a properly sized installation with EV. Also agree with PC that overstating the benefits of solar, or any green tech is counter-productive. Both naysayers and reasonable advocates will poke holes in the story and that is no good. It makes one wonder – if fabrications are required to mke solar look good, then it must not be very good. Please amend your article to provide accurate data, the pros/cons of solar must be shown in the proper light (pun intended!). I must also ask – why ‘plan ahead’ with an over-size system? I can understand planning for the space – but solar proponents keep talking about how solar prices are coming down every year. So why not install more later at lower prices? You also have to take into consideration the cost of the volt is actually higher than a comparable gasoline powered alternative. Add another $5-$10k to the balance for the difference. When you consider most people won’t keep their cars long enough to make up the difference your logic falls apart. Nice try though! No, his math is valid because’s he close to comparing like-for-like on the car price. The Acura MDX is comparable (if not a bit more) than the Volt. It’s basically a wash.
Hmmm – seems to me the cost of grid electricity would figure somewhere in considering the benefits of the electric car. I assume you’re logic is that you oversized the panels and weren’t using the excess electricity (was your grid provider paying you for it?) so the gas savings aren’t offset by anything, but that’s an artificial assumption and not one a real economic analysis would include. As a solar advocate myself – please don’t overstate the benefits of solar and give our enemies the false stories they can poke holes in to make even the real benefits of solar look fake. PC – I followed Kevin’s math perfectly. I am not just an advocate of solar electric, I am also a guy that put panels up on the roof. In my case, I was paying $300 a month for my electric bill, and now I am paying $450 a month for my panels. But in just 4 more years I will own my panels. They will produce free electricity for at least 40 years. Like Kevin, my house went up in value. But here is something I didn’t expect. The panels are keeping our house a couple degrees cooler from the shade factor. I am going to buy an electric vehicle this year because I can’t use all the power I generate on air conditioning. I tried to use it but the house was an icebox in the summer. I agree with this, the savings per month should only be based on how much you would be spending on electricity every month for the car. Someone without solar panels could just as easily get an electric car and save that money by buying electricity instead of gasoline.